October 7, 1973, could have been the end of the beginning for Tyrrell F1 but instead it was non event that turned out to mark the beginning of the end for the Team. This was the date of the US GP at Watkins Glen that year. Tyrrell didn't compete. François Cevert had been killed in practice and Jackie Stewart withdrew, into retirement, from what would have been his 100th GP. Ken Tyrrell had enjoyed the Sterling services of Stewart for years, certainly the first four years the team had moved up to be constructors, but his retirement should have been a simple transition to Cevert, a rising star who everyone expect could, and would, slip into the team leader role and continue the epic success the team had enjoyed up to this point in time. 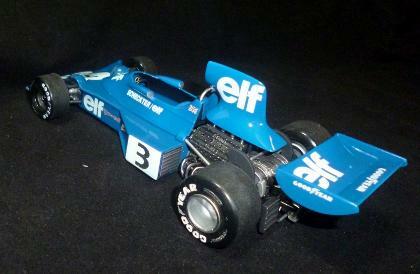 As it was Team Tyrrell needed two new drivers, and a new car. The 005/006 cars were outdated now and on the circuit it showed. One thing that has always been important for continuing success is continuity, an that was just buried along with Cevert. Tyrrell F1 was in trouble. Ken Tyrrell exercised his legendary talent spotting skills to sign Patrick Depailler and Jody Scheckter for the 1974 season. Both were relative newcomers to F1 but both had a raw talent, give them a good car and they would take the fight to the opposition, no doubt about it. Designer Derek Gardner was busy creating the “give them a good car part” but it was slow to develop and not ready until the fourth race of the season, in Spain, leaving the drivers to campaign the older models as best as they could in the first three races. Depailler managed to garner a few points in this interim period but Scheckter was struggling. When the 007 did make its debut in Spain the tables turned and Scheckter went on the take six Podium positions including two victories that year. Technically the 007 was an evolution of the previous models but was quite different from its predecessors. It also borrowed from McLaren, Lotus and Ferrari designs. Tyrrell's bulky nose/front-wing assembly was replaced by smoother wedge shaped nose and smaller wings. The aluminium monocoque chassis tub was slimmer and more angular with new 'conning tower' cockpit surround which now had the mirrors faired into it rather than wide outboard on thin mounting arms. Tyrrell's trademark round airbox was replaced by a new much slimmer design but underneath it was still the Cosworth DFV 90º V8 DOHC power unit and a Hewland FG 400 5 speed Manual gearbox. The car weight 1296.3 lbs (588kg) which meant that with the 155 bhp/liter that the normally aspirated, Lucas fuel injection fed, DFV put out the package had a power to weight ratio 0.79 bhp/kg. Wheelbase and track were both increased with the new base being some 8” longer at 102”, or 2591mm if you prefer. Track width was now 63.1”, or 1603 mm. Suspension was by double wishbones and coil springs over shock's all-round; the front being inboard and actuated by rocker arms. Brakes were the usual ventilated discs but mounted inboard, all-round. Four chassis were built in 1974 and two more 1976, as with the 006 naming designation they were numbered 007-01 and onwards. 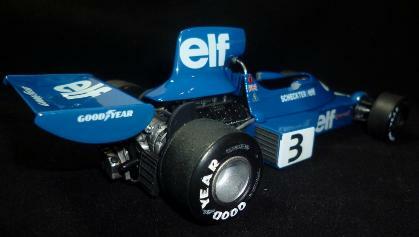 The previous Tyrrell system of numbering each chassis in sequence rather than the design had well and truly died out. The team raced the cars through into 1976 with Scheckter taking three victories in total and the team finished third in the Constructors' cup in 1974. Tyrrell was no longer a title contender and never would be again, despite coming up with surprise wins from time to time, and even more surprising ground breaking designs, Tyrrell was dying; even if they didn't know it. However, Formula 1 is about creative ingenuity and being at the forefront of technology and Team Tyrrell certainly kept pushing the boundaries. The 007 was replaced by the revolutionary six-wheeled P34 in 1976. 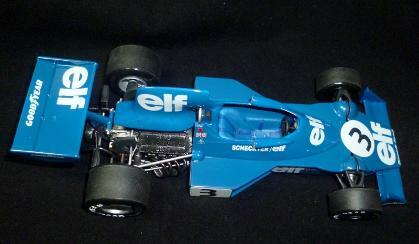 Our car is modelled on Tyrrell chassis 007/01 which won the 1974 Swedish GP. It had a total of 21 race starts, 12 being in F1, the first race was the Spanish GP (28th Apr 1974). 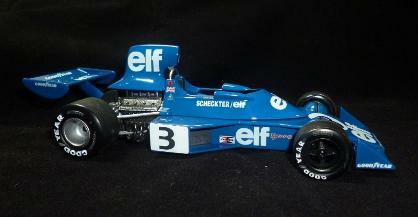 After Tyrrell retired the car it was sold to Ian Scheckter, Jody’s older brother, to drive for Lexington Racing in the 1975 South African F1 Championship, he won six of the nine races to win the title. Chassis 007-01 is currently in the Franschhoek Motor Museum, Franschhoek, South Africa. The 7th race of the 15 race 1974 F1 season was the Swedish 'Texaco' Grand Prix held at the Scandinavian Raceway, Anderstorp. 80 laps of the 4.018km (2.505 mi) circuit would provide the test for man and machine, a total distance of 321.440km. The Tyrrell team were still recovering from the loss of World Champion Jackie Stewart, who had retired, and rising star of François Cevert who died in a horrible crash at the end of the 1973 season. The new driver line up consisted of Jody Scheckter, a 24-year-old from South Africa and a 29-year-old Frenchman Patrick Depailler; and both were now getting to grips with F1. Other new faces for this race were Bertil Roos who took over Brian Redman's Shadow when he announced his retirement. Reine Wisell subbed in the factory March team as Hans Stuck who couldn't drive due to a broken thumb.Tom Belso stood in for Arturo Merzario at Frank Williams Racing Cars/Iso Marlboro as the broken finger Merzario sustained in a sportscar crash at Imola proved too troublesome for him to race, although he did practice. Richard Robarts took the second Frank Williams Racing car, though he was destined not to start the actual race. Leo Kinnunen made his F1 début for AAW Racing Team in a Surtees TS16, but Francois Migault was left without a car as BRM simply couldn't repair their cars in time. In Qualifying Patrick Depailler took pole position with a time of 1'24.758. This represents and average speed of 170.660kph. Amazingly Scheckter was second on the grid just +0.318 behind Depaillers time. The second row held the two Ferraris of Niki Lauda and Clay Regazzoni. Behind them Ronnie Peterson (Lotus) was fifth with James Hunt (Hesketh) alongside. Jacky Ickx (Lotus), Jean-Pierre Jarier (Shadow), Emerson Fittipaldi (McLaren) and Carlos Reutemann (Brabham) completed the top ten places. For race day, 9th June 1974, the weather was sunny and the track was dry. At the start Scheckter, in Tyrrell 007-01 wearing #3, got the jump on Depailler (#4) and took off in the lead. Ronnie Peterson also got a better start than Depailler, gaining three places to move into second, leaving the Frenchman in 3rd place. Niki Lauda just held off his Ferrari team mate Regazzoni, who was followed by the Brabham of Carlos Reutemann in 6th. This remained the Status Quo until the Lotus of Peterson developed driveshaft problems, he slid down the order before retiring on lap 72. The two Tyrrells were then in a private race to the flag with the Ferraris doing their best to hang on. Gearbox problems then befell Clay Regazzoni about lap 11 and he slowed, eventually retiring on lap 57. James Hunt's Hesketh slipped past the Brabham of Reutemann around lap 20 and he moved up to fourth as Regazzoni continued to fall back. When an oil leak stopped Reutemann on lap 31 Fittipaldi moved into fifth with Hulme sixth. At mid-race Lauda's Ferrari developed both rear suspension and gearbox problems which slowed him enough for the charging James Hunt to catch and overtake him on lap 66, but only after a superb 20 lap duel had thrilled the fans. Lauda later retired his Ferrari. Hulme went out with a suspension failure on lap 57 moving the March 741 of Vittorio Brambilla up to sixth place, only for gearbox gremlins to attack his car and slow him markedly. Brambilla eventually finished 10th two laps down on the winner. Hunt set about chasing the Tyrrells and began slicing into their lead at the rate of 2 sec's a lap. There just wasn't enough time left in time left in the race so the Tyrrell pair scored a magnificent 1-2 victory. Scheckter led the race from start to finish in a fitting tribute to the management skills of Ken Tyrrell. The Tyrrell team totally dominated the race and Scheckter scored his first World Championship win, also the first for any South African driver in an F1 World Championship race. Jody Scheckter completed the 80 laps in a time of 1:58:31.391 which is an average speed of 162.723 kph. 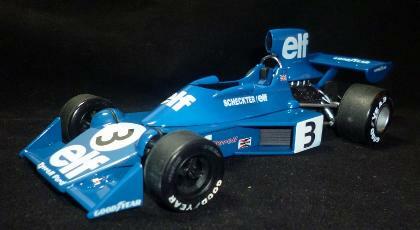 Depailler was just 0.380 sec behind at the finish with Hunt 3.325 sec behind the winner. Fastest lap was set on lap 72 by Depailler, 1:27.262 representing an average 165.763kph. Hunt's 3rd place gave Hesketh their first ever points, and podium finish, and the final point for 6th place went to Graham Hill who had worked his way up from 15th place on the grid. It was his first point in two years. The race marked the only starts for Leo Kinnunen and Bertil Roos and the end of the road for both Reine Wisell and Tom Belso who had actually driven very well to finish in 8th place. Incidently, Vern Schuppan, who was the first reserve driver for Ensign-Ford, started from 26th place on the grid and completed the race before anyone noticed he shouldn't have been on the grid and had actually started illegally. He was disqualified post race! 1/24th scale kit by Tokyo Marui. Originally Ian was going to make this super detailed and with a cosworth engine from one of the Heller kits. After some consideration he decided it should be made from the box because it is very much a product of it's era. Many Tamiya kits of this period were also made to carry motors and batteries. Personally I hate the idea and I am probably not alone which is why the fashion died out. Tokyo Marui was founded in May 1965 by Mr. Iwao Iwasawa, obviously in Tokyo, Japan. ‘Maru’, meaning a circle, is a popular prefix in Japan to which Mr. Iwasawa simply added the first initial of his name. Today the company is the market leader in “airsoft” BB guns with a passion for attention to detail that has seen their products feature in many action films. In the 1970s and early 1980s Tokyo Marui attempted to compete with Tamiya in the scale model world and the models were very much a product of the era. In both cases the popularity of electric powered models meant they produced kits that gave away scale accuracy in the chassis and interiors in order to accommodate batteries, motors and of course to add strength to the model in case of accidents. The exteriors for the most part were faithfully reproduced, except for the short lived F1 series which simple didn't have the room to hide motors or batteries. Tamiya got around the issue by moving up to a larger scale and 1/20th scale has become the default standard for F1 plastic models. TM didn't change scale and their F1 models have enlarged engines and virtually no cockpit detail. 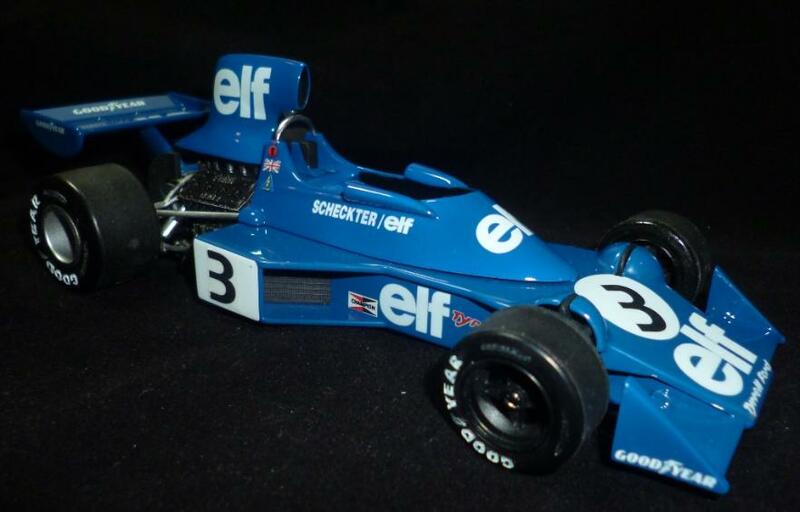 The company eventually concentrated on the road cars in 1/24th scale and the F1 cars went out of production, consequently they have become incredibly rare (and expensive). From 1988 TM moved into radio controlled model cars and produced a very good range of 12 models which were very competitive against the Tamiya series of RC models. TM have also made some diecast models and RC aircraft but their most popular model ever has nothing to do with cars or RC models. It was a styrene foam aircraft called “The kamihikouki”. Apparently almost 2,000,000 of these products were launched from the eager hands of young children. Ian built this model in mid 2014, more or less straight from the box. The paint colour is Tyrrell blue from Zero Paints, which is covered with a super gloss from Plamo UK. The kit decals were too old to use so replacemet decals were obtained from Patto's Place in Australia. The chrome parts were stripped and cleaned up so that Alclad II chrome could be applied. It is interesting to see how modern paints and techniques can work wonders on an old kit, Ian has other kits from this range and intends to do a full detail version of the McLaren M23 in due course.